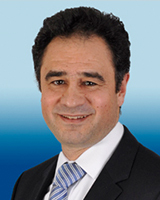 Karim is the Managing Partner of Arthur D. Little Austria and leads the TIME practice globally. He has more than 20 years of experience with ADL in the telecommunication area. In Arthur D. Little, Karim’s work focuses primarily on three functional areas: Growth Strategies and business transformations, Corporate Finance, Boardroom presentation and facilitation.Besides, he acts as Jury member for several international Telecom & Media prize award ceremonies. He supports several telecommunication councils and associations as well as governments and regulators in setting their (digital) agenda as advisor. Karim is also chairing and facilitating top executive international events and conferences. Before joining ADL he worked for several years for Ericsson and was a research assistant professor at the University of Technology in Vienna. Karim holds an MSc, MBA and PhD (Tunisia – Lycée El Menzah V, France – Lycée JB Say/ESEM, US – UC Berkeley and Austria – TU Wien).